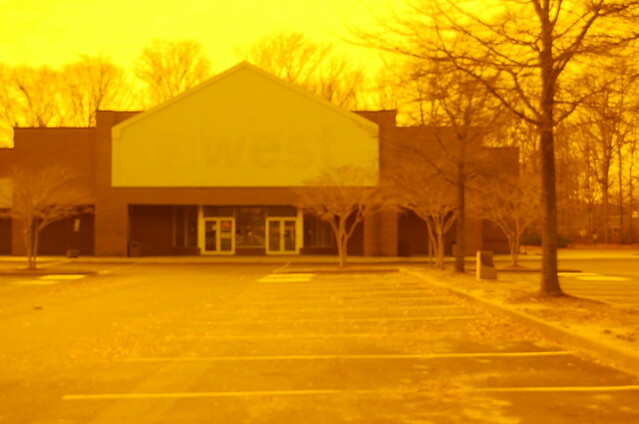 drugstores | That Mall is sick and that Store is dead! Here is the entire paper. The ads start around page 130-ish. 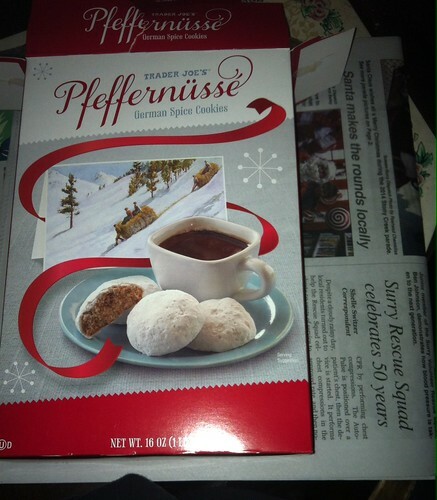 I’m going to have some Christmas Cookies from Trader Joes while the images upload. 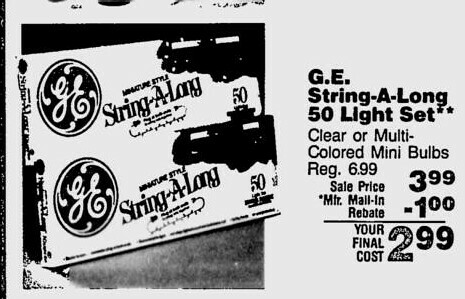 When I was little, I thought these were called Sing a Long Lights, and when you plugged them in, tinny sounding xmas music would emit from them. Look at all the exclamation perfume. I finally bought some last weekend at WalMart, they had the small bottles for $3. Xmas with the Turtles at Ames. This woolworth paper was specifically for mall locations in the area. Hence, the nicer merchandise, like the NES, SNES, and Game Boy. Pretty sure my Woolworth in Hampton, VA never had merchandise this nice. I do remember them selling Rollerblades at my location. 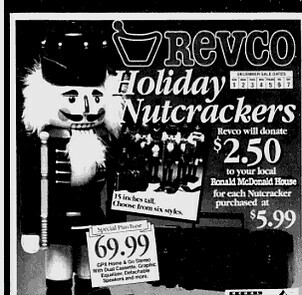 Revco used to be all about the nutcrackers. Did the VCR Plus really work? It seems so much easier and cheaper back then to learn how to use the timer record function. A few months ago, I went to the Fox Hill area of Hampton (where I grew up) to visit an old friend. 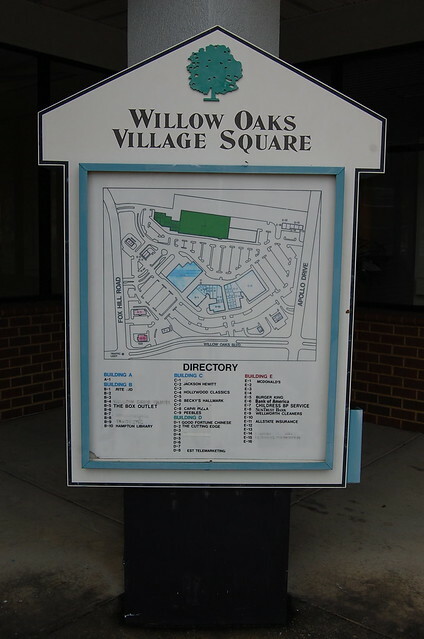 I went by the Willow Oaks shopping center where mom and I used to do all our shopping back in the 90s. It’s pretty sad now. It’s only real strength now is the Farm Fresh which replaced the old Super Fresh/Farmer Jack that was torn down in the Summer of 2000, I believe, it was right before my folks and I left Hampton. 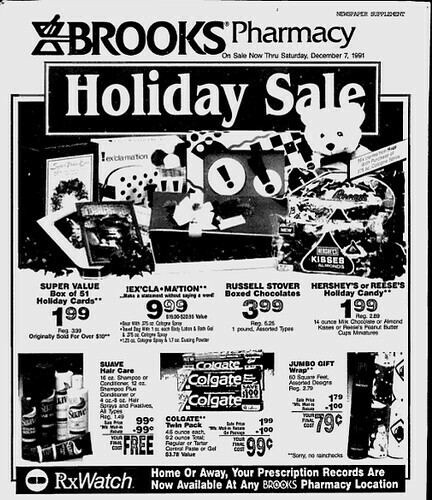 Nothing has changed about this Rite aid since the 90s. Everything has remained the same, it was almost scary, I felt like I was in 8th grade again and I was begging mom for nail polish or sneaking lipstick in her cart. Oh. Derp. 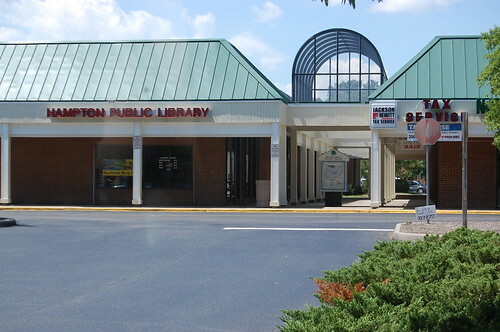 Another selling point of this shopping center is the library. I don’t think I’ve been in here since 2001 when I was a senior in high school. 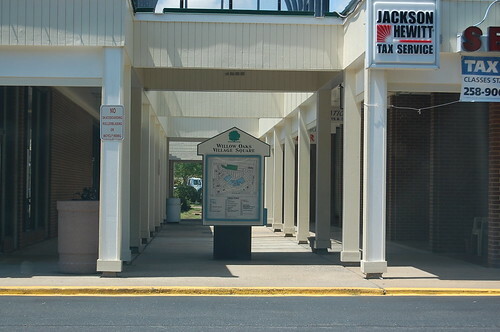 Growing up, I seem to remember none of the stores in the breezeway staying open for long. 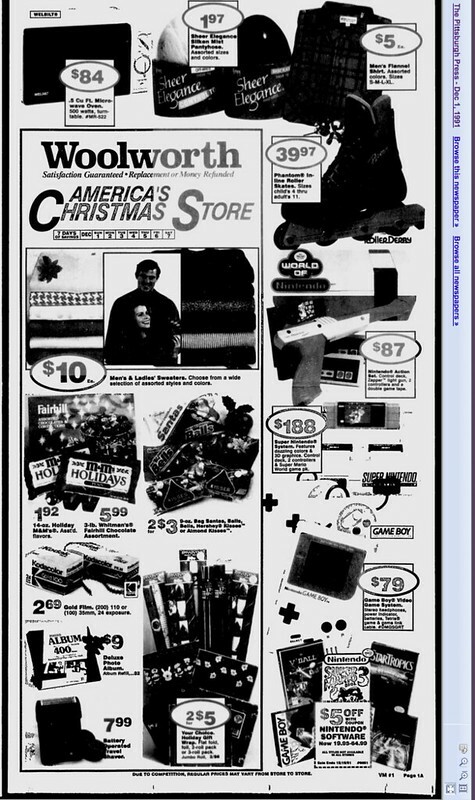 I remember a dollar store there the summer of 1994, and my mom buying a ton of useless junk from there. 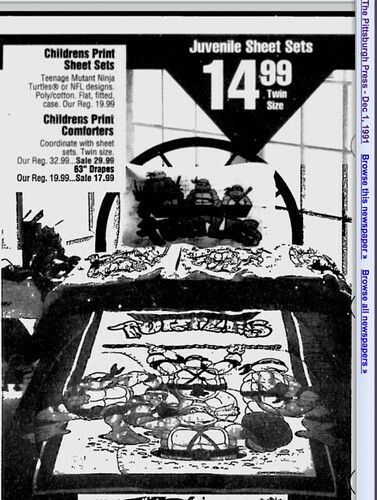 This was a One Price $7 store where all the clothes were $7 each, back in 1992-1994. My mom bought all my clothes from there during my late elementary school years. I’m pretty sure it has stayed abandoned since 1994. 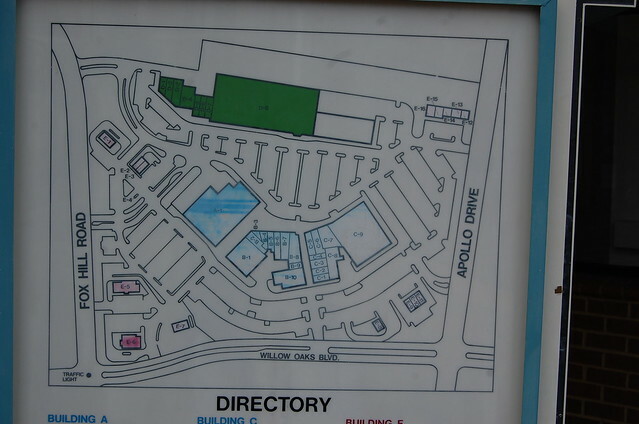 In the back of the shopping center, there was office buildings. My tutor and my dentist were in these offices. I suspect I know why my tutor went out of business, and I guess my dentist retired. I remember the leaves always piled up here. My knockoff Blythe doll was enjoying the leaves. Last year, I got tired of just taking pictures of … buildings. 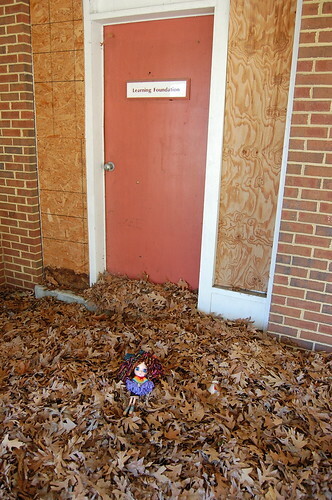 So now I bring one of my dolls to pose at the abandoned buildings. Don’t judge. 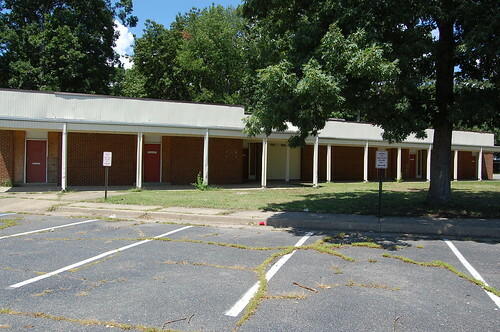 So, the abandoned Roses/West Telemarketing building. 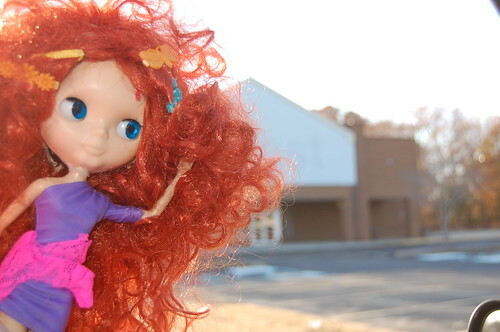 Here is my other knockoff Blythe doll, Eyebrows in front of the abandoned building. 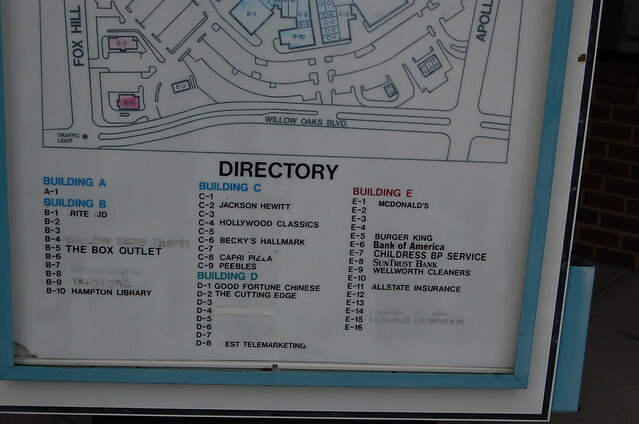 The directory is almost correct. It’s a few years off. The Farm Fresh (building a1) isn’t on here, and its been open since 2000, 2001? Why is drugstore.com selling walgreens stuff? Buy Walgreens pain & fever relief, new products, and new products products online. …I thought they were affiliated with Rite Aid? It looks like the last Rite Aid thing they have is the Rite Aid Self Grip Athletic Bandage. CVS/pharmacy has purchased five sites on the Peninsula and plans to open four stores this year. Opening this summer are stores at 13000 Warwick Blvd. 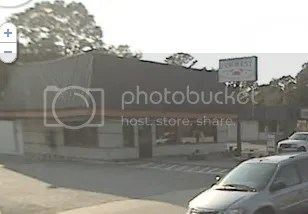 in Newport News and 2315 W. Mercury Blvd. in Hampton. Stores opening in the fall are at 4432 George Washington Memorial Highway in York County and at 11117 Jefferson Ave. in Newport News, CVS/pharmacy spokesman Mike DeAngelis said. 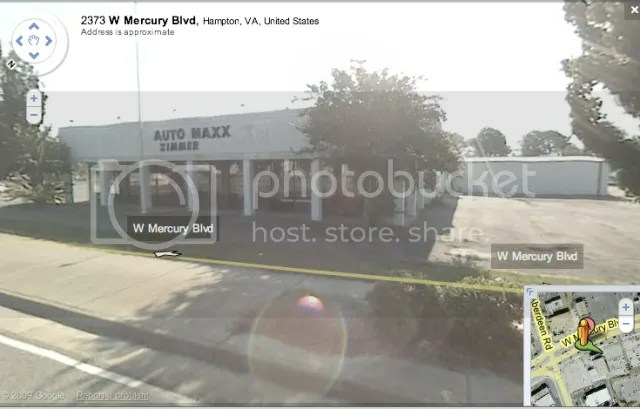 The company also bought a second Mercury Boulevard site but doesn’t plan to open a store there in 2009, he said. At a time when retailers across the country are closing stores, CVS is looking to expand into the Hampton Roads area, where it only operates three stores. Nationally, the company plans to open 250 to 300 stores, DeAngelis said. “Our business is not recession-proof but to a degree we’re recession-resistant,” he said. “People are still getting sick. They’re still getting their prescription drugs. The other products we sell are essential items, they’re not big-ticket items. They’re toothpaste, shampoo. The company already operates stores at 700 Merrimac Trail in York County; 1187 Jamestown Road in Williamsburg; and 1109 Benns Church Blvd. in Smithfield. Two Virginia Beach stores are slated to open this year, DeAngelis said. Walgreens, a competitor with nine stores on the Peninsula and 26 in South Hampton Roads, is opening two stores this year on the Peninsula. 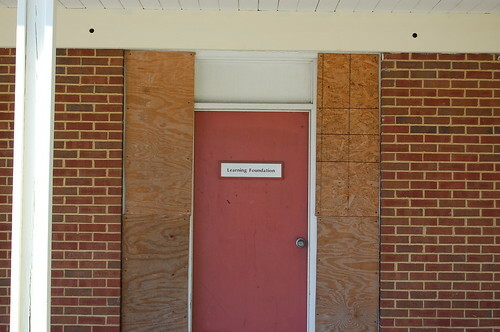 A store at 2400 George Washington Memorial Highway in York County is expected to open this summer, and another at the corner of Warwick and Denbigh boulevards in Newport News is scheduled to open in the fall, spokesman Robert Elfinger said. Together, the new CVS and Walgreens stores will create between 130 and 160 jobs. The Walgreens stores will span more than 14,500 feet, employ 25 to 30 people and include a pharmacy, groceries and a one-hour photo lab, Elfinger said. The CVS stores will span more than 13,000 square feet and employ 20 to 25 people. The stores will have drive-through pharmacy services, one-hour digital photo processing, multiple kiosks for customers to print photos, and health and beauty items and greeting cards, DeAngelis said. “It will have all the earmarks of a full-service retail pharmacy,” he said. The company offers an ExtraCare customer-rewards program. Cardholders get 2 percent back with every purchase in the form of “Extra Bucks.” They also get one Extra Buck for every two prescriptions filled. The rewards are doled out quarterly. Throughout the year, cardholders can take advantage of special offers and savings, DeAngelis said. This is actually up the street some, I was wrong. Silly google maps.